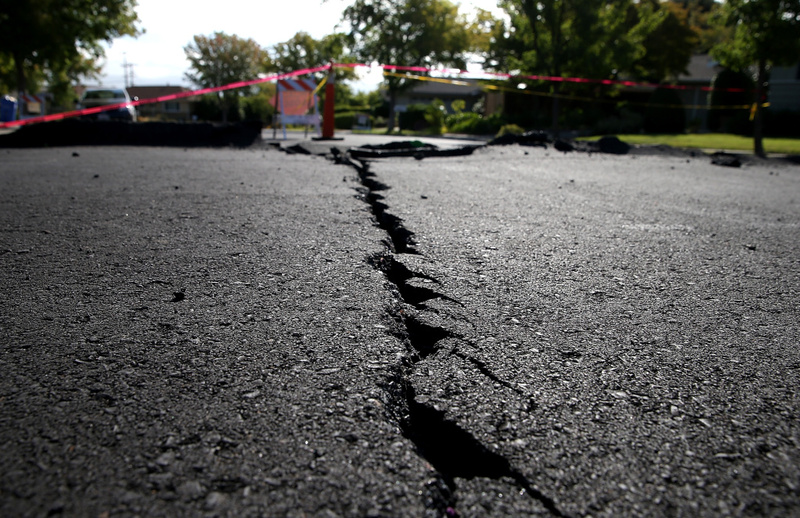 A crack runs down the center of an earthquake-damaged street on August 26, 2014 in Napa, California. But actually, about 87 percent of homeowners do not have earthquake insurance -- and a new report from free-market think tank R Street Institute looks at what implications that might have on the national scale. Fannie Mae and Freddie Mac own a significant portion of these uninsured mortgages in California, and according to the report they could stand to lose between $50 and $100 billion in the next earthquake. (Assuming that homeowners without earthquake insurance make the decision to walk away from their mortgages.) And because Fannie and Freddie are federally supervised mortgage finance institutions, the government may in turn bail them out -- meaning that financial cost would fall on taxpayers. Will the next big financial crisis come from California’s “big one?’ Why has it been so difficult to get California’s homeowners to buy earthquake insurance? And what are some potential solutions to consider ahead of the impending earthquake’s financial fallout?